Where Have the Affordable Homes Gone? Bubbles are self-defeating. Their success is what eventually kills them. The same is true for cycles. As a population urbanizes, people get wealthier. But more affluent urbanites have fewer kids and that slows future demographic growth for the next generation. At first, the faster home prices go up, the more people buy (usually with a mortgage). But at some point, fewer and fewer people can afford the prices that are outstripping economic growth and incomes. And fewer people want to sell a winning hand, so there’s less inventory. That’s exactly where we are today across the U.S.
And it’s worse in Canada and Australia (especially since they didn’t have a bubble burst in the great financial crisis). Their prices and consumer debt ratios are far higher than ours. The situation has gotten so bad in Australia that Greg Owen of GOKO Management has asked me to come back to his country six months earlier than I normally would! Prices are cracking with increasing speed in what once seemed like a Teflon real estate market thanks to high Asian immigration and foreign speculation. Here at home (in the U.S.), this chart shows that home sales are slowing, even though the economy is doing better after Trump’s tax cuts. This is happening because there aren’t enough affordable homes available for sale! Last time around, home sales peaked late 2005 into early 2006, long before stocks peaked and the economy slowed into recession. Back then, the catalyst was a combination of high prices and increasing defaults. This is currently the case in Australia, with one million out of nine million households in mortgage distress! 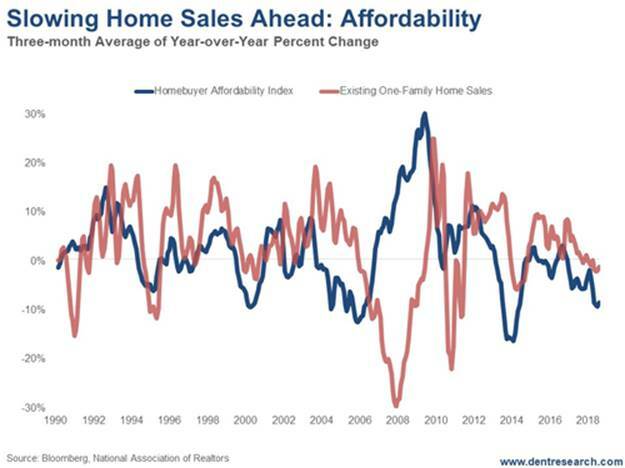 In the last year, U.S. homes have become 10% less affordable due to rising prices and higher mortgage rates. They’ve become 40% less affordable since early 2009, despite the boom and lower rates the last few years. And Who Buys Most of the Homes? People age 27 to 43… and right now that’s the Millennial generation, which just so happens to be having the hardest time buying a home. 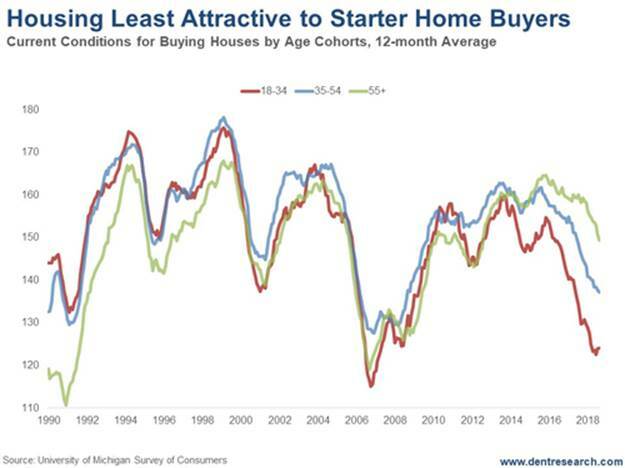 This chart shows that the home buying comfort index has fallen the most for the 18-to-34-year old group, which contains the prime starter home buyers (the peak is around age 31). Their index has dropped 33% from 158 to 122. For the prime trade-up buyers in the 35 to 54 age group (with their peak at age 41), it has dropped 14%, from 160 to 138. Unfortunately, the 55-plus age group doesn’t matter much (possibly the only time I could say this for the Baby Boomer generation), except for the smaller percentage of vacation homes. Even their home-buying comfort levels have dropped 10%, from 162 to 146. Weakness in home sales is dragging down the most-bubbly economies – Hong Kong, China, Canada, Australia, the U.K., and to a lesser degree, the U.S. This is another sign of a looming recession, which could turn into a depression this time around now that central banks have largely run out of ammunition in the fight to prevent the Depression of 2009!